The fifth and penultimate fixture of the Mid Lancs Cross Country League took place at Leigh on Saturday, slightly out of the county boundaries but hosted by Leigh Harriers affiliated for extra competition. In the Senior Women’s 6.8km course Kath Hoyer Wesham’s only female runner, finished as 4th W55 and 73rd overall in 25:44. In the incorporated M70 race Peter Bartlett performed well to finish 4th in 30:25. Dave Waywell was 5th in 31:22 and the pair just beat Chorley AC to the M70 team glory with the same points but winning by countback. In the Senior Men’s 10km race Rob Danson was back in action and flew away from the field to win in 32:02 with a 21-second lead from second placed Luke Minns of Blackpool. Backing him up David Taylor put on the pressure and finished 44th in 37:24. Mark Belfield put in a good run for 73rd place in 39:04. Andrew Harling was next Wesham finisher in 101st place with a time of 40:25. Steve Myerscough finished 144th and 42nd M40, Wesham’s first masters’ finisher, in 43:30. John Collier was next in placing 4th Over-60 and 164th overall in 44:42. John managed to beat Nigel Shepherd on this occasion, who finished 7th Over-60 and 170th overall in 45:05. Ben Wrigley put in another great performance finishing 207th in 47:50. Martin Bates was 18th M60 and 222nd overall in 49:07, giving the Wesham Senior Men’s team 14th place overall. For the first time this season the Men had a ‘B’ team, finishing 17th. The grouping of Collier, Shepherd and Bates 9th Over-50 team position, and 1st Over-60 team, giving them a great chance of team medals overall for the season. Martin Bates ran the Central Lancashire 5km on Sunday to complete a weekend double, clocking 23:29 for the hilly course in Leverhulme Park, placing 5th M60. 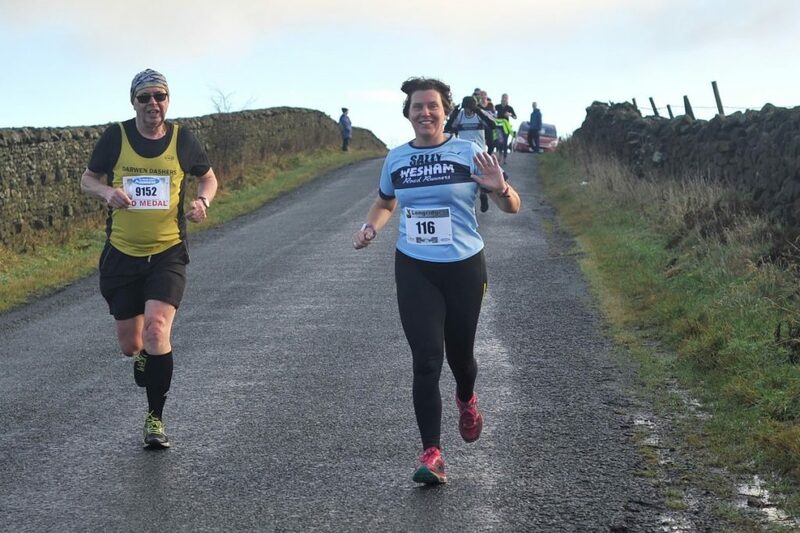 Tanya Shaw finished 136th the Valentines Day 10k on Sunday in Lancaster, 4 days in advance of the day itself, running 53:20 for 40th woman and 5th W40. This was a popular race with 256 finishers and winning times of 31:43 (men) and 37:26 (women). Anne Berry ran the Muddy Shoes 11-mile on Saturday finishing 41st in 2:14:34 in the navigational event across the fields from Caldervale. A new route is used every year so that it is unknown until the day, making it an orienteering event. Wesham members were busy Saturday morning at parkrun, although the high winds caused the cancellation of the Lytham Hall, Fleetwood Promenade and Lancaster events. Most local runners diverted to Blackpool’s Stanley park, where Chris Hastwell recorded the second fastest time of the morning with 19:13 to record an M35 age graded performance of 68:60. Lee Barlow clocked 21:23 for an M45 grade of 67.34% and Lee Nixon set a First Timer best of 21:29, a great run for an M35 grade of 62.61%. Stephen Browne ran 22:57 for M50 65.87% and Dave Marsland set an M60 grade of 71.23 with his time of 23:07. Suzanne Leonard clocked 24:21 with a W45 67.21 with George Kennedy running the same time for an M60 grade of 66.46%. Andrew Moore ran 26:38 with an M55 58.70%; Graham Cunliffe clocked 27:59 and M60 58.31%; Sharlan Butcher ran 28:34 for W45 55.60%; Dawn Biggs 29:53 with W50 56.78%; and Phil Leaver 31:16 for an M65 grade of 53.62%. Tracey Hulme ran the South Manchester parkrun at Platt Fields and ran 24:58 for W55 72.50%. Rob Danson had the fastest time in the Preston parkrun with a modest 18:13 for an age grade of 70.81%. Steve Abbott ran 22:16 for M40 62.20% and Robert Brown recorded an M60 age grade of 59.57% with his time of 27:10. David Taylor was in to some pace making and ran 28:13, with Paul Carter running 29:33 for M45 49.51%. The parkrun Tourists were in South Yorkshire at the new Frickley Country Park run between Wakefield and Rotherham. Steven Gore ran 20:58 for an M35 grade of 63.67%; and Vicky Gore recorded 29:50 for W40 52.35%.